It's never easy. I spent yesterday foodling around with the new computer and how to efficiently get it going, fonts loaded, life continuing with relatively little fuss. However, small things change--like the type of fire wire that is accomodated and the whole porting of files over wheither it be from Time Capsule or from a hard drive back up which I had as well. But, not to complain, if its not hard--then the sweetness of having a fully operational setup is not as sweet. More to come today--but I feel its with only one hand tied behind my back, not both. And the promise of sweetness is at hand. Can you say FAST. I will be able to get back to full crankage...really throwing the work out...and big files too! I recolored the fu dog to my delight (ready for Picture Salon). Double Happiness is having some tweaks and the Octopus redraw, this weekend. I hope this afternoon I can do one or both...or sock in Peter Hoover's good edits and have the paper finished. I need to finish something and move on. Then, Livy waits in the wings. I am glad the other work from Chris Payne and Gary Kelley hasn't sailed over the transom yet as I want to have the wits needed for their project. I need to be freed up to think about these projects. Am getting fired up about the portraits. We had a soaking rain last night (that's what Chet, the Lawnmower man proclaims we need regularly). Its a dark grey morning with lovely humidity and the grass is velvety in its lush green-ness. We are on to herbaceous peonies along with all of the garden's iris are blowing out. 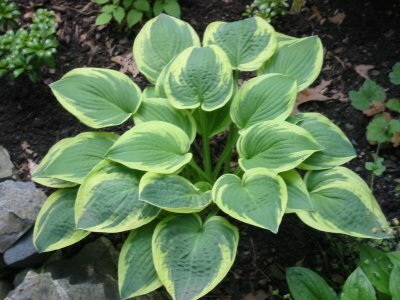 The hosta that were given to me as a present from our painter have expanded exponentially as always. I do not know what Timmy fed these things, but he brought me 3 plants originally that I split before spading them in. Last year, I split them again--and quite honestly, I could split them into threes right now and have plants that are plenty big and robust at the end of the season. But, I think I will wait and see how huge they become. Alex is here glowering at me. Gotta go and pour the orange juice!